One of my mentors (Barry Rhein, the guy who gave me the words to name my "genuine curiosity") recently gave me Richard Marcinko's book, "Leadership Secrets of the Rogue Warrior." This is not a new book, and I'm surprised I haven't run across it before. But man - I am very glad I know about it now. Marcinko's "in your face" writing style initially led me to believe this was about the most irreverent management book I'd ever read. As I got into it, I realized I'd missed the point. Marcinko is actually very respectful - to those who've earned his respect, regardless of their rank, position, etc. And, in stark contrast, he is absolutely (scathingly) irreverent toward anyone who refuses to learn how to be a better leader, or chooses to be comfortable in a life of incompetence. This book takes you through a comprehensive set of management principals by introducing you to each of the "Ten Commandments of the Rogue Warrior." Each "commandment" is explored in Marcinko's colorful way, then illustrated with vivid, memorable true-life stories that really drive the point home. Some of the stories are Marcinko's own, while others draw on great leaders of history (not just military leaders, by the way) to explain how they dealt with difficult situations in a manner consistent with the ten commandments. This one is about being prepared, but goes beyond "thinking" about being prepared. Marcinko urges businesses to conduct "war game" like exercises (red team vs. blue team) to vigorously test out strategies, and come to view your own company as your competition sees you. Very powerful. Excellent illustrations here about the fatal potential of relying on conventional wisdom, flawed first impressions, and thinking you know what others expectations are without confirming them. The stories in these chapters make these commandments come alive. I will be totally committed to what I believe, and I will risk all that I have for these beliefs. I will always be easy to find; I will be at the center of the battle. 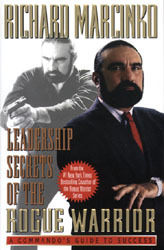 --Richard Marcinko, "Leadership Secrets of the Rogue Warrior"
Marcinko's point is this: Whether you lead in life-or-death situations, or you lead in a "normal" corporate environment doesn't matter much - you need to aspire to great principles to be a great leader. What a powerful way to lead - and live. The bottom line: This book is a wonderful combination of inspiration, instruction, admonishment, and motivation. I highly recommend it. One word of warning: the language in this book is rough - it's peppered with "f-ing and blanking" - but the message, concepts, and stories are golden.